Our spacious guest rooms feature contemporary decor with stylish furnishings including the Hyatt Grand beds, state-of-the-art media and work center with a high-definition 42 inch flat panel television that easily integrates with laptops and other electronic devices, a cozy corner L-shaped sofa-sleeper, bathroom vanity upgraded with granite countertops. Enjoy complimentary hotel-wide wireless high-speed internet. A 24-hour Grab & Go food outlet that serves made to order light fare. Gated self parking is available for $28.00 per day. World of Hyatt members can enjoy our complimentary breakfast when they book an eligible rate. Our breakfast includes premium ingredients, cage-free eggs, and regional chef-inspired dishes. Starting January 1, 2016 Parking will increase to $25.00 per day. PET POLICY: 1-6 NIGHTS A 75 NON-REFUNDABLE FEE. 7-30 NIGHTS A 75 NON-REFUNDABLE FEE PLUS AN ADDITIONAL 100 CLEANING FEE-INCLUSIVE OF TAXES. MAXIMUM OF 2 DOGS PER ROOM ARE PERMITTED. WEIGHT MUST BE 50 LBS OR LESS MAX OF 75LBS PER RM FOR 2 PETS. FEES ARE IN USD. 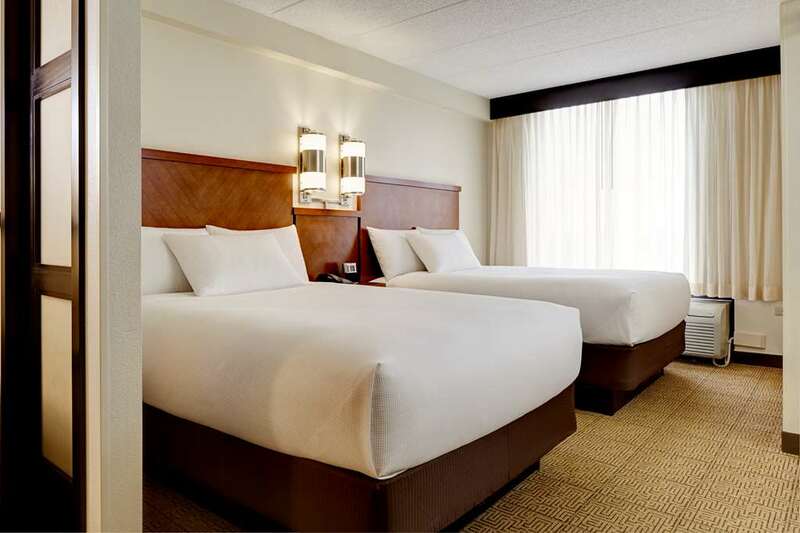 Hyatt Place Atlanta Downtown is in the heart of downtown Atlanta walk to all attractions/shopping/conventions. Located across the street from the SunTrust Plaza Building, 2 blocks from the AmericasMart, 1 block from the Hyatt Downtown and next door to the IRS Headquarters-Summit Building. 1 block from the Hyatt Regency. CARTER PRESIDENTIAL LIBRARYVisit President Jimmy Carter's oval office-lifetime mementos-beautiful gardens. Turner FieldHome for the Braves Games. Underground AtlantaShopping and food courts, late nite entertainment in a unique historical venue. AMERICASMARTMart is for registered buyers to purchase items to sell in their own shops. SunTrust PlazaAcross the street from this beautiful,corporate hi-rise building.